Why is my VHF radio reception disturbed? This might be due to the VHF antenna you are using. However, there is a solution for it. Please, connect the antenna cable of the car radio „without ground“ to the easySPLIT, i.e. only the inner conductor/pin is to be used. Do not connect the outer conductor/cable which is connected to the ground of the chinch plug or to the ground of the car radio!The physical effect put in a nutshell: An antenna is always a dipole. Normally the inner conductor of a coaxial cable is connected to the upper dipole and the outer conductor is connected the lower dipole of the antenna. However, the customary antennas for pleasure crafts do not have a lower dipole. This lower dipole is simulated by an adapted network (i.e. simply a high-frequency transformer). The adapted network is adjusted to a frequency range of approx. 150 Mhz to 163 Mhz. Thus, the outer conductor of the antenna cable has the important function to adjust the antenna to the frequency range of 150-162 Mhz. So, if you do not use the outer conductor, colloquially called “ground”, for the car radio plug, you simply have a „cable antenna“ for the car radio which should work fine for the VHF radio frequency range. Why is the light not lit? High voltage drop? If you used a fairly thin cable (0.14 mm² cross-section) for the extension, the total cable length amounts to 10 m, the voltage drop would be about 1.3V. Due to this drop it may be possible that the internal voltage regulator will no longer be supplied with sufficient voltage and thus does not work properly. Another cause might be a simple short circuit (direct connection from + to -). The basic question is, whether the Powerbook has a serial COM interface (RS 232). Some laptops do not have it. You can help yourself with a USB-to-COM adapter (which can be bought at e.g. Conrad, Media Markt, Saturn etc.). The Apple or PC software (e.g. a terminal program) uses this COM interface and shows the encoded telegrams (ship reporting etc. ), which have been received by the easyAIS. As the easyAIS works according to the NMEA0183 standard, the information is received as ASCII-telegram at 38400 baud (start and stop bit, no parity). Every common terminal program – no matter on which PC or Apple – can display these characters. In order to decode the AIS information you need a special software (e.g. a card plotter program with AIS functionality). You can find a PC software on www.yacht-ais.de. Unfortunately, we cannot say whether it works with Apple or not. Is all NMEA data passed through the GPS antenna or only the GPRMC? On November 6, 2006 we changed some program parts in the firmware, since that time all NMEA data is passed through. What is the minimum distance between VHF antennas that should be observed? We recommend a minimum distance of 80 cm. (e.g. Simrad recommends 100 cm).Please note: Regardless of the distance of the VHF antennas to one another, the antennas should be mounted as high as possible. The higher you mount the VHF antenna, the better is the transmission. The frequency range of the VHF radio output is limited to 108 MHz, i.e. higher frequencies cannot pass this output. For this reason, the reception of DVB-T is not yet possible. Information: The reception of wave bands outside the VHF range is not possible with most frequently installed VHF antennas, i.e. in the best case the lower range of the VHF-DVB-T-band may be received. The reception of higher VHF wave bands requires a change to a multi-band antenna. Due to the commonly used coaxial cables (RG58/RG213) and coaxial plug-in systems (PL259/SO239) the transmission and reflection losses in the plug and socket connectors increase at higher frequencies to such extent, that adequate reception of higher frequencies would only be possible with a loss of quality. For this purpose it would be necessary to replace the used plugs and sockets by VHF-suitable versions. How can I register my radio unit? If you want to operate a DSC radio unit or the AIS transponder easyTRX on a ship, you need a license for this radio unit.You can obtain it from the Bundesnetzagentur (Federal Network Agency). The Federal Network Agency of your radio station will send you a MMSI number, which should then be programmed into the easyTRX. If you already have a MMSI and would like to operate an additional easyTRX, you need to send a notification of change to the Federal Network Agency. Is there a possibilty to check if everything works properly? When the red light flashes, the easyAIS is receiving messages. If there is no object in the proximity, the light is not flashing and nothing will be displayed on the plotter screen. Is there a unit which combines the functions of AIS transmitter and receiver, weather fax and antenna splitter? Is it possible just to transmit with an easy TRX? Although you just want to transmit, it is necessary to have both antennas. The unit must receive the exact position, in order to transmit your position. So you need a receiver to get your position and a transmitter to send your position. Which baudrate is the best for AIS? By each AIS channel there are 2250 AIS position updates possible. That means that on both frequencies (161.975 & 162.025MHz) 4500 messages can be sent. An AIS position report (Msg. 1/18) is send by a VDM-Message. This message has a length of 50 Bytes. 4500 (max. VDM messages per minute / 60 = 75 (VDM/second) Therefore 75 AIS position messages could be received per second. So on a channel load of 100 percent there will be 37500 Bit / s.
The baud rate of 38400 is perfect then. to handle a 4800 Baud rate (Bit/s)? With this baud rate you only can receive 9,6 VDM messages and this is already a channel load of 12,8 %! All of these three sentences will be transmitted every second and they have a length of ~2000 Bit. Lets subtract the 2000 Bit / s from 4800 Bit/s and we have only 2800 available Bit/s. 2800 Bit / 500 = 5,6; now there are only 5,6 VDM / s! And this is only 7,5% channel load which you will have very fast in some areas. Rotterdam, Singapore, Shanghai with 40-50 percent! In a near distance to waterways you can have 20-30 % very fast! If you are crossing and sailing in areas with waterways we really recommend using always the high baud rate of 38400 to not lost AIS position updates! If you just drive within Non-High-Traffic zones 4800 Baud is ok when you switch off GPS sentences. For example the easyTRX2S can be set to „None“. Example: easyTRX2-S settings within the Programming-Tool. Why is my position not seen in Vesseltracker / Marinetraffic / etc. ? Amongst other things, the reason could be that you are out of range of the receiving station of this web-services. Also it could take some time to see all your data there, it is not 100 percent live! To check if the other vessels receive your position, just ask them by your VHF radio. This is the easiest and most effective way. 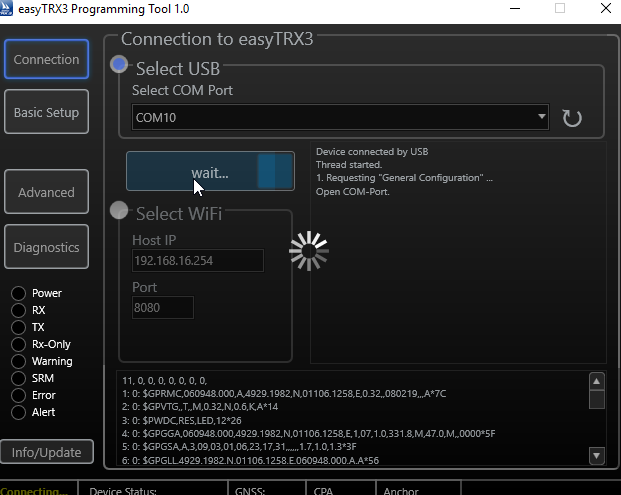 How to connect the WiFi of my easyTRX2S/AIS to PC? To get AIS/GPS data by WiFi on your PC some navigation softwares need a COM port. Now you have to send data from TCP/IP (from WiFi-Board) to your PC. This is done by a VSPE-Tool (Virtual Seriell Port Emulator). Please unpack this zip file and start the setup procedure. After this you should see an icon on your desktop, please start this. After a few seconds a green symbol is seen below right of your desktop. You an click on this to set more settings. If the window is empty you can load the right settings which are also contained on this ZIP file. This is called config-V1.vspe or config-v2.vspe. V1 is only used in old WiFi modules. So please try v2 first. With the integrated multiplexer in our easyAIS it is possible to connect all external NMEA data sources with 4800 baud and to up convert these to 38400 Baud. With regards to the data source type there is no restriction. I would like to set up easyAIS to read GPS and other NMEA data in at 4800 baud and pass all of this data out with the AIS sentences on the NMEA out port at 38,400 baud. Is there any method to check if all is working as it is supposed to work? If the red led is flapping, the EasyAIS is receiving telegrams. The range of AIS could be up to 20 – 25nm under good conditions. If no target is nearby, you will see nothing flickering and nothing on your plotter screen. 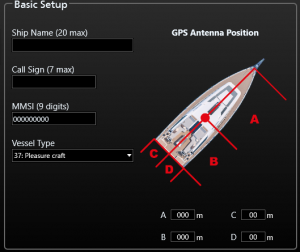 Can I insert other NMEA data together with the GPS data input into the easyAIS? Yes, the data are passed through. Does the pass-through of additional NMEA-data only work in one direction? 1) Passing through of further NMEA data: The data is passed through only in one way that means pc data do not go back through easyAIS into the GPS.2) Reduction of the baudrate: it is generally o.k. Many of our customers are using the lower baudrate of 4800 because of different facts. To do that we have had a jumper on the board in the first generation of easyAIS products. Now we do it by a special start up procedure which is described in the manual of the easyAIS 2nd generation. But it takes a little bit longer with 4800 baud until you have all data on your pc. The typical result of the lower baudrate: For example if you have 160 targets (at the moment we know the Rotterdam harbour is the only one which has such a high number of targets) With 4800 Baud it takes about 40 seconds until you get all the dynamic data onto your display. If it is no problem for you to wait to receive the objects onto your display, you can use one port with 4,8 kB. But if you would like to have the objects in real-time you should prefer to use maybe a 2nd port where you can get the easyAIS NMEA data by 38400 Baud. Does this receiver support Class B or does it need to be upgraded? Both versions (A and B) of transmitters work on the same frequency and – what is more important – they use the same transmission protocol. The difference is the content of the telegrams – not how these telegrams are transmitted! Therefore: Our easyAIS is of course able to receive Class A and Class B data. No problem for that. Can the easyAIS Class B receive telegramm? In the past we hear from several persons again and again, that the easyAIS cannot receive Class B telegrams. The only short and clear answer we can give is: It`s wrong.Please look again onto our homepage at the point: “AIS Capability”and read the difference between Class A and Class B transmitter. The telegrams and the frequencies are identical. If you receive a class A transmitter telegram, you also receive a class B transmitter telegramm. Do not be unsettled by such statements. Summary: Of course, you can receive telegrams of a class B transmitter by an “easyAIS”! Yes, data are passed through. Our integrated multiplexer is converting NMEA 1083 signals from 4800 Baud to 38400 Baud, not depending whether it is a GPS or another signal. If you pass your fast heading signal through to our easyAIS into your C80, everything will work smoothly. (It works for one unit from which the signals are passed through to the NMEA input of the C80. )Please don’t forget to configure the NMEA input at your plotter to 38400 Baud. You do not need a multiplexer at all. Yes, the latetest generation of the Navman Plotters are easyAIS compatible. With reference to the cable we did following:The exsiting cable is already 5m long. We tested the VHF/GPS combination antenna with an additional 10 m long cable. At the end the total cable length was 15 m. The additional cable was a simple RG58 cable. It had a male TNC plug and a female TNC plug as extension plugs between the existing cable and the TRX. The plugs were crimped to the cable. This worked very well. All the satellites in our hemisphere were visible. Therefore we can guarantee a 100% working for a cable length of 15m with RG 58. But as you know as better the cable is, as better the reception and transmission will work. Unfortunately, your suggested way does not work. It is not possible to connect with an USB plug. The reason for that: serial and USB use different levels for data transmission. Also Windows needs a driver for every USB connector. The solution for you will be this: You solder a sub D-9 connector onto the cable. The connector goes into a serial<->USB adapter. And you attach this adapter into the pc. We can deliver a SUP D 9 pole connector and also an adapter. FAQ: easyAIS 2nd. Gen. >>>The easyAIS can be connected with a pc (this is also in the manual on page 12). Connection of the easyAIS to the pc: Please connect the white-orange cable with the pin 2 of the SUB D 9-pole connector (female) and the orange cable with the PIN 5 of the SUB D 9-pole connector. It is very urgent, that you take the right PINS. They are hardly readable at the plug, but they are signed. After that, please install the USB serial adapter on the pc. Then you can connect the SUB D 9 connector with the adapter. Please note the interface must be configured correctly: 38400 Baud, 8/N/1. Can the easyAIS receive and display the specifical datas from the barge AIS-senders (inland AIS) since 01.04.2008? Yes it works very fine. We are located near by the rhein-main-donau-canal, 9km distance and we do daily continuous receive 8-15 AIS objectives in the canal. The barger do not uses an other “AIS” as the navy. The method is standardized. Does the receiver support class B or is an upgrade necessary? Both versions of transmitters (A or B) are working with the same frequency and what is more important, they have the same transmission-protocols. The difference is the content of the telegrams, not the way the telegrams are transmitted. Therefore our easyAIS is certainly able to receive class A and class B data. So this is not a problem. Yes, only connect your easyAIS-IS to the USB-Port of PC/Laptop. It will emulates a virtual COM-Port. So you can still use your AIS-Software. Take clear if you are in an area with enough AIS-Signals. Test if your antenna-connectors are not bad. Überprüfen Sie, ob Sie das USB-Kabel bzw. Power/Daten-Kabel richtig am PC/Plotter angebracht haben. 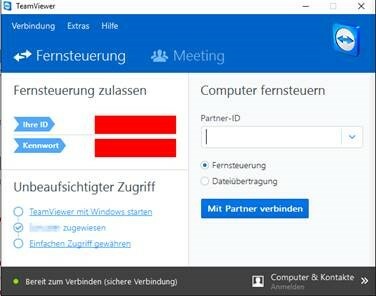 Dies können Sie mit dem Standard Windowsprogramm “Hyperterminal” testen. Dieses finden Sie unter Start/Programme/Zubehör/Kommunikation/Hyperterminal Wählen Sie dort den richtigen Port aus an dem Sie den easyAIS-IS angeschlossen haben. Außerdem müssen folgende Einstellungen vornehmen: Bits pro Sekunde: 38400; Datenbits: 8; Parität: keine; Stoppbits: 1; Flusssteuerung: Hardware; bestätigen Sie mit okay. 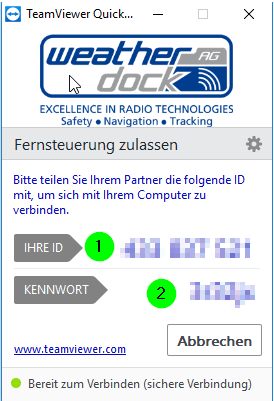 Sie sollten im Fenster nun NMEA-Daten sehen wie folgt: !AIVDM,1,1,,A,13u?etPv2;0n:dDPwUM1U1Cb069D,0*24 Sie haben alles richtig gemacht. No, installation can be quite arbitrary. Fins operate more than adequate in any position. Yes, that is no problem. But it´s necessary that your chartplotter can use the baudrate of 38400. You cannot change this as it was possible on easyAIS 2.Gen. So if you have a chartplotter which only work´s with 4800baud you should take the easyAIS 2.Gen or work with your PC by means of the USB-cable. For receiving DVBT on board you need the following hardware: your already available VHF-antenna, an „easyDVBT“ – a DVBT receiver (commercial) and a TV. Later you can complete the easyDVBT with an easySPLIT and easyAIS. Because of the higher frequented DVBT-channels (500 bis 860 MHz) have in the coax-cable a higher decay compared with the navy-radio-signal, it can be necessary to use a high quality, low-loss coax cable at higher cable lengths. Types of good coax cables are e.g. RG 213/U, AIRCELL 7, ECOFLEX 10. 2..
Also a preferably uninterrupted transmission of the receiving signals from the antenna to the easyDVBT is only possible when you use the installed coaxialcable with together fitting coax plugs and jacks (.e.g coaxial deck-disconnection point).. In the easyDVBT the TV-Receiver-Signals will be separated (filtered), heightened and routed to the TV-receiver. This will be only successful, when an adequate high signal level is at the easyDVBT input. That means that the decay of the signals from the mast-top to the input of the easyDVBT has to kept small. This effect is not wrong, it is just the logic consequence of the unit. Reason for that is the following. Imagine, that a VHF would “over the easyDVBT” directly transmit with 20W. The TV or the receiver would immediately be broken. Therefore the easyDVBT unit needs to disconnect all other connected units, (except the VHF Radio) in the moment when the VHF Radio is transmitting. Let us explain what influences good reception. How does the unit work: Normally a VHF antenna do not receive well the UHF frequencies of the television transmitters. But there is still a reception signal, even with the regular VHF antenna. What the easyDVBT does is, that it amplifies the UHF television signal so that the digital receiver can work with the signals. But to do so, it is necessary to get an “even small” UHF signal to the unit, to amplify it there. Poor transmission power of TV stations In some areas the coverage and the transmission power is not very good. This means that almost no signal is received. Summary: To recveive a good TV signal out of the easyDVBT you need a good cabling, e.g. RG213 or Aircell 7 or Ecoflex 15 and good cable connections from the cable to the unit. Also the area where you are sailing is important, that there is enough “signal strength” to reveive TV signals. The unit itself probably works well, but there are 3 different outside influences which could spoil the results from your easyDVBT:A) Cable quality and length The DVBT frequencies are received by a regular VHF antenna, but not in a sufficient quality to watch TV. What our unit is doing is to amplify the signal strength so that the digital receiver box can interpret the signals. But amplification only works, if there is a base level of signals at our easyDVBT. If the cable which is used or the transitions between the cable and the inside of the cabin is no good quality, we do not get any “amplifiable level of signal” into the easyDVBT. Proposal for a solution: Use of a good quality cable e.g. RG 213 or ecoflex 10. Attenuation of RG213 or Ecoflex 10 at 1000 MHz is around -2dB/10m which is an acceptable value. RG58 is very bad for TV frequencies: Attenuation of RG58 at 1000 MHz is -6,4dB/10m which is an enormous attenuation. Another important factor of the quality is the connector: The TV high frequencies lose signal strength if the transition into the cockpit is soldered too easy and not “by plugs and sockets”. You easy loose -3 to -4 dB if only soldered not in a very exact coaxial way. B) Self oscillating of the amplifier In a very seldom, but possible case, the amplifier starts self oscillating in consequence of a critical impedance of the existing cable and the VHF antenna, which is very bad. To find a remedy, you can extend the cable by 1-2 meters. If this does not help, please ask us for a little electronic system which eliminates the oscillating, material No. B041. C) Polarization of the TV transmitter from the TV stations VHF antennas are made to receive vertical polarized HF waves very good. This transmission of DVBT is the norm, for that reason everything should work fine. But we found out that some TV transmitters in the Baltic Sea stilldo work with horizontal polarization (as in the former years) and then the polarization might course technical difficulties. If you want to receive per horizontal polarized TV transmitter, please notice our self-developed “horizontal wave catcher” unit for the regular bar antenna (except of fibre glass antenna). Yes, the connection FM <=> antenna is always active even when the device is switched off as this is a basic security feature. This means the VHF radio installation can be used even when the easyDVB-T is switched off. Horizontal radiations are bad received by the FM antennas, since the antennas are vertically aligned. When you are often in areas where you receive horizontal signals, you will need a horizontal receiver on your UKW antenna. This begins by 3 horizontally mounted rods and receive horizontal field lines. It is simply put over your existing VHF antenna. However, it only works with Steel rods VHF antennas and not with plastic hard antennas. Can I receive DVB-T2 with my easyDVB-T? The easyDVB-T is amplified the frequencies of 180 – 850 MHz. DVB-T2 is using the frequencies of 470-690 MHz. So you can answer this question with yes. Your easyDVB-T is able to amplify the latest DVB-T2 signal. Which kind of data will be transmitted through the class B transmitter? The class B transmitter, as you know, is a “light” version of the class A transmitter. The differences are:Class B: lower rate of telegrams (e.g. every 30s for a speed of 14kn, whereas for the class A transmitter it is every 10s). Does not transmit the IMO number or the call sign. Does not transmit ETA ordestination. Does not transmit the status of navigation. It is necessary to receive or transmit binary messages. Does not transmit if the the ship is turning. Does not transmit the draft. Is it correct, that the easySPLIT has a standby-current of only about 25 mA and however the OCB-version has 120 mA. The normal easySplit has a lower standby-current because the relays, which is switching off the AIS and FM – radio while the VHF-transmission, does not need a current during the standby mode. However the pin-diods inside the easySplit OCB need a standby-current. It is possible to combine your DSC Pacific with our easySPLIT OCB. But please do not put the easySPLIT OCB between box and antenna, but on the exit for the VHF radio. Yes, normally no problem. But you have to check whether the C70 is already AIS capable.If you find an “AIS topic” in the systems configuration if it is AIS capable. If there is no “AIS settings” you probably have to make a plotter software update first. For that please contact your Raymarine dealer. Also please check, whether the NMEA port is “free”. If this port is occupied with another unit and a different data speed in comparison to the easyTRX (easyTRX has got 38400 Baud data rate), than you might need a multiplexer to get the data with different speed into one NMEA port. You need a PC only one time at the beginning to enter your MMSI and the rest of the ship data like name, length, etc. etc. After this is programmed you do not need any more your PC. If you do not use, either a plotter, nor a software I could recommend “Yacht AIS” from the company Y-tronic. They have a very simple, but very nice software which shows the other ships in a radar screen and which gives you also an alarm on the PC if the ship is in your CPA range. Following is the reason: Class B transmitters, as ours, work within a process which is called SOTDMA. (self organized time division multiple access). This means the big vessels listen to the traffic and the information containing in all other telegrams and defines it’s own raster of transmission timing, which is then distributed to all other participants within the radio range. Our class B transmitter, as all the others too, is using a “listen-before-talk-method”. This means, that before transmitting, a ship has to observe the radio transmission timeslots, whether to be allowed to transmit, if the timeslot is not occupied, or whether to wait for a free time slot. A timeslot is very very short (app. 25ms). Therefore the starting time of a class B telegram must be very exact on time. This is only possible by a microsecond exact timebase. Normal GPS antennas do have an accuracy of 1 sec., sometimes a little bit better, but not as exact as necessary. With the GPS antenna which can be purchased from us the microcontroller inside the easyTRX is calculating the timebase in microseconds and therefore it is proofed that the telegram is transmitted exactly when it is allowed. With a normal GPS antenna this would not be possible. The combination antenna is easy to mount and works very well.The quality of the reception is very similar to a regular VHF antenna. The difference is the height of the antenna in which the combination antenna is mounted normally. A typical mounting place of the combination antenna is the railing at the stern of the ship. This “mounting” height is much less than the height of the masttop. In our practical use we found out, that the transmission range and the reception range is more or less the half. With our easySPLIT OCB and the masttop antenna you have a typical range of app 8nm for the transmission of your AIS data and app 25nm for the reception of other AIS data (Depends of course of the antenna and cable quality, as well as of the weather!) This is simply due to the reason of the physical effect of the VHF (Distance is line of sight and you know, as higher, as better). With reference to the cable we did the following: The existing cable is already 5m long. We tested the VHF/GPS combination antenna with an additional 10 m long cable. At the end the total cable length was 15 m. The additional cable was a simple RG58 cable. It had a male TNC plug and a female TNC plug as extension plugs between the existing cable and the TRX. The plugs were crimped to the cable. This worked very well. All the satellites in our hemisphere were visible.Therefore we can guarantee a 100% working for a cable length of 15m with RG 58 But as you know as better the cable is, as better the reception and transmission will work. Please note that you need a separate GPS Antenna for the Class B transceiver.The antenna which is on board, does not work probably. The normal GPS antenna are „active“ antenna, which are already sending a coded telegram (NMEA 0183). These telegrams are perfect adapted for PC programs and cardplotter. Most telegrams are only closely for 1 second or 1/10 second. That is to incorrect for a class B AIS transmitter. The timebasis for AIS radio communication must be closely 1ms also a/1000 second. This accuracy will be reached when the GPS antenna is sending the raw data to the Class B AIS tranceiver also easyTRX. The raw data are transmitted from easyTRX into the correctly time base. Thats why you need an separate GPS mushroom-type antenna, which send the raw data to the easyTRX. easyTRX 1. Generation >>>At first a general information: The easyTRX is “dull” in regard to data evaluation on the PC. This error is probably due to your plotter or PC software.The easyTRX always sends the own position in a NMEA-Sentence, too. It is the sentence “VDO” (own AIS position). The other targets (ships) are sent with the sentence “VDM” to the plotter/PC. We guess that the plotter or PC software you use does not make a difference between VDO and VDM. An update could help here. The easyTRX can not suppress the VDO, because it is mandatory. The easyTRX sends, like all other CLASS B units – position data and static data. It is mandatory when and how often these data has to be transmitted. In that point, there is no difference in Class B units.Position data (Msg.-type 18) are sent every 30 sec if you are faster that 2 kn, else it is sent every 3 min. The static data (Msg.-type 24) are sent every 6 min. It is always exactly 6 min; more often is forbidden. After switching on, it could last up to 6 min until the static data are visible to other ships. What you detect is totally o.k. and normal.This is due to the difference between dynamic and static data. In the AIS radio net there are at the moment 24 different message types existing. The dynamic data of a class B AIS transmitter are sent with the telegram type 18. The static data of a class B AIS transmitter are sent with the telegram type 24. Each telegram, not depending on type length is 25ms. All telegrams are checked internally in the easyTRX, if all the data are received completely. If the checksum is not correct, the telegram won´t appear on the plotter screen.Dynamic data type 18: If the pleasure vessel is faster than 0,1kn the transmission cycle time is 30sec. If the pleasure vessel is at anchor the transmission cycle time is 3min. Dynamic Data content: MMSI, SOG, Position Lat and Long, COG, UTC and TH. Now the situation is the following: Let’s say the customer gets the first input of dynamic data at 8nm distance. It might take max 6min from that point that the other Class B ship sends out a static data. If there are interferences the customer might not get the static data once. So he has to wait again for further 6min. With the dynamic data, a “lost” of one telegram is not so dramatic, because these are repeated every 30s. With the static data, a “lost” of one telegram is suboptimal, because these are repeated every 6 min. The error originates from the coast guard’s software.The standard of AIS Class B for pleasure boats has been realized in 2006. We know that some older AIS Class A ships have problems with the Class B transmissions. It is only a matter of time until the older Class A update their software. If the coast guards ask you again about that problem, you can show them the certifications number which you can find in the manual. It is the number BSH / 46162 / 4320638 / 07 and says that the unit is legal. My Raymarine plotter shows a “vswr fault” continuously. What is wrong with it? If you changed the antenna and the fault is still appearing, the problem might be the plotter:You have to know that the easyTRX is sending failure messages regularly. There is “flag” in each failure message. This flag shows whether there is a real failure or only the regularly “internal check” and the report about it. The Raymarine C70 and C120 have an old software that is not able to decode Class B AIS (pleasure boats) messages. They only show Class A AIS (commercial vessels).Please do an update to version 4.29. This is the software which is able to display Class B AIS! How can I reset my MMSI number? Following instruction is only valid for our easyTRX2 and easyTRX2S units and its derivate! To reset your unit on your own is not allowed by law. Only the manufacturer or distributor is allowed to do that. a. with this tool we will afterwards logon your PC to reset the easyTRX2. b. You don´t need to install the software. You also can start it only when downloaded it. You need this ID and password later. e. If you have a older easyTRX 1. Generation #A023, please use following Programming-Tool. f. Unzip the ZIP-File and start installation. Connect your TRX2/TRX2S to power supply of 12/24V and USB to a free slot of your Windows PC. b. If windows makes troubles recognize your USB driver you can download it from here (use Windows version again). i. Use a USB to RS234 adaptor and connect the black SUB D 9 socket to it on the PC. b. If you have a older easyTRX 1. Generation #A023, just hit the “Connect” button, it will search automatically for your unit. c. Press “Connect”, if you are connected successfully you can see a green bar with “connected”. a. Send us ID and password by mail or give us a call (+49 911 376638-30) which would be faster. We will logon your PC then (please close all other programs) and make a factory reset of the unit. a. Also here it means: programming the MMSI number is only possible once. If you enter it wrong we need to make the factory reset again. Why is there only the easyTRX2 manual in the easyTRX2-IS package? There is only one difference between both devices -> the splitter. So we disclaimed to print an extra manual. The splitter-function is under 3.7.1. The AIS Receiver of the other ship is overloaded. It means the AIS receiver is getting to high signal from the easyTRX/ -IS. Cheap AIS receivers (made in China …) can be easily overloaded by a strong AIS signal. If you use products of weatherdock company you certainly don’t have the problem with overload of the AIS receiver. All our products are absolutely overload-save. If you use Norton as Antivirus program that could be the problem. Norton SONAR does not know these *.exe-file of our Programming-Tool. It will be deleted. So for the time you program the device you could disable this SONAR-protection. You can set it in your Norton Programm Interface. This can caused by a lot and you cannot say it easy. To solve the problem please connect by USB to your PC and open the Programming-Tool. Under the page “Diagnostic” you can see the error. The easyTRX2 / S measures after every transmission how much power was sent to your antenna(Forward power) system and how much of it comes back(Reverse power). 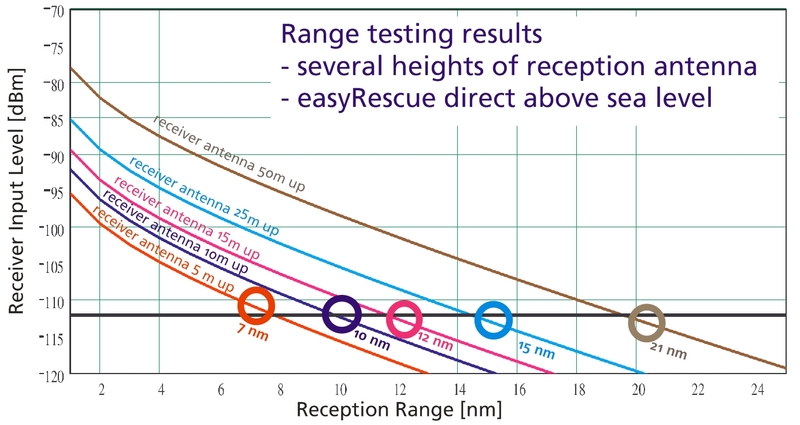 The easyTRX2 / S use these values and calculated if your antenna is good or bad. An error is reported when the “Forward TX power” no longer is worth at least 3 times higher than the “TX reverse power”. You can find these values in our Programming-Tool. If this happens, please check your antenna system and whether all adapters and connectors are properly connected. 1. Make a note of “TX power forward” and “reverse TX Power” if your unit is sent with attached antenna. 2. Now disconnect the antenna and wait for 6 minutes. If the values differ only low (about 30), so please contact our technical support. What about the compatibility of Weatherdock WiFi products? All Weatherdock WiFi products, such as easyAIS_WiFi, easyAIS-IS_WiFi, easyTRX2_WiFI and easyTRX2-IS_WiFi, are fully compatible with popular AIS navigational apps for iPad, iPhone or iPod, e.g. A new license is mandatory. An existig licens for Chart plotter is not useable. All Weatherdock WiFi-devices are also compatible to the charged Android-App iRegatta. The WiFi units are ready for the usage with Windows XP, Windows Vista or Windows 7 while system is running 32 bit. 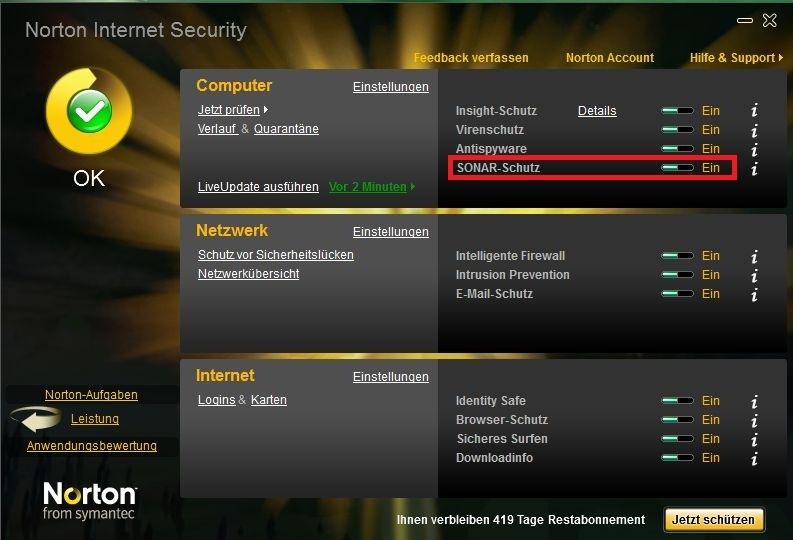 You´ll find password and network name underneath your device. Following instruction is only valid for our easyTRX3 units and its derivate! Give us a call under: +49 (0)911 376638-57. The saved data on your internal storage of the easyTRX3 will not be deleted by that Factory-Reset. Start the Programming-Tool again if you want to insert new ship datas. 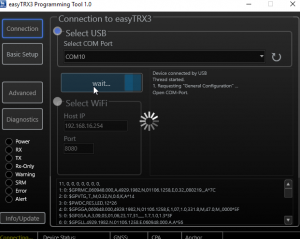 if you connect the easyTRX3 only by USB, only the microcontroller is active! That`s fine for programming your shipdata already at home. The max. current from your USB socket is approx. 500mA. But if the easyTRX3 should transmitt, we need for 26ms a current of 2A. Thats absolutely too much for USB. Please connect the USB cable to your PC or Laptop directly to a free USB slot. Using an external USB-Hub, we recommend to use one with an own external power supply. After connected well, you should see an COM-Port within the Programming-Tool. Try the highest number first. If its not the right, just select another and press “Connect”. You´ll be forwarded to the next page automatically. If you don´t see any COM-Port please try to use another USB-Slot directly on your PC/Laptop. Where could I find the easyTRX3 Programming-Tool?